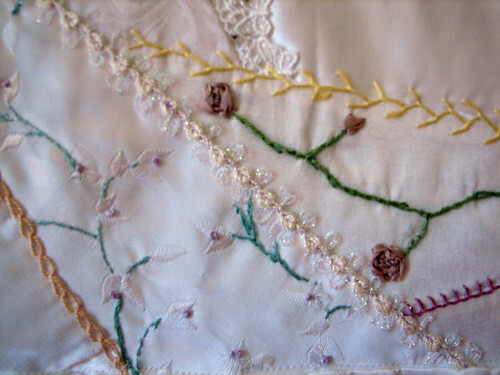 A Stitch in Time...: Shall I Entertain You With Some Photographs?? 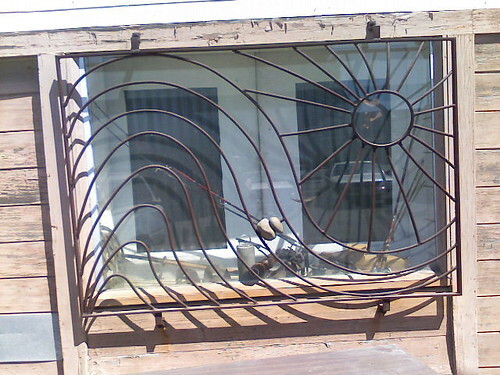 Cool Window. Part of my Flickr photostream. Found on an abandoned building on a side street in Berkeley last Saturday. Shot with my cellphone. Because doesn't everyone use thier phone as their auxiliary camera anymore? I think it's quite cool, even though it's slightly askew. Wednesday was one of those days when I run around like a banshee, never lighting long in one place to do one thing, yet all I have to show for it is one load of folded white laundry. That was washed and placed in the dryer last night. So all I really did yesterday was fold it. And I'm calling it good. Left the house just after 8 am., to drop my car off at the dealership. It needs an oil change service and one of the dummy lights was on. They thought it would be done about noon. Fortunately, I had arranged for a friend to come pick me up for the morning. Called her while she was still in her jammies, trying to get her grandson to eat some breakfast. You know how it is with four-year-olds. They need to assert their independence. I sat on a bench outside, knitting on my jaywalker socks and listen to Christine Kane on my mp3 player until she showed up. Back at her house, grandson still not done eating but running around buck naked. I played with their dog until said child found his dignity and underwear, then spent a nice hour or so talking computer talk with her 17 year old son. We had our laptops open side by side and worked and played and chatted. It was quite pleasant. My friend was amused by us, but not really interested. Then on to the main reason for which she had rescued me from the dealership. 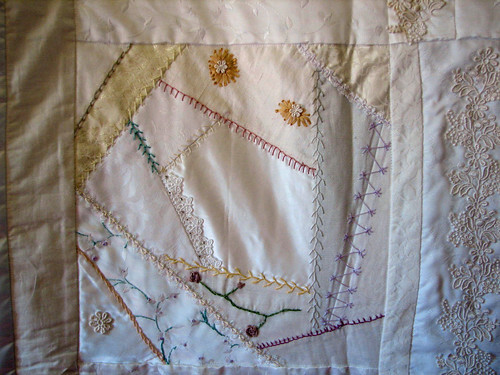 Another Pickle needed a difficult quilt project photographed and did not have a camera up to the task. This was one incident when the camera-phone wouldn't cut it. (though I must admit that my Lime Chocolate takes damn fine photos!) My job was show up with my gear (camera, tripod just in case, and before-mentioned laptop) to try and do the piece justice. More on that later. After shooting was done, there was a baby-grand-daughter to gurgle over. I did none of the gurgling, as I just particularly care for babies (There! I've said it!). But the two gals there were quite content to carry on themselves and not at all offended that I chose not to play too. Meant more baby facetime for them. Which worked for us all. Home. A couple phone calls, folding said load of laundry, writing this post, then off to go out to supper with the spouser and business rep.-friend in from San Antonio. I am such a social butterfly!! 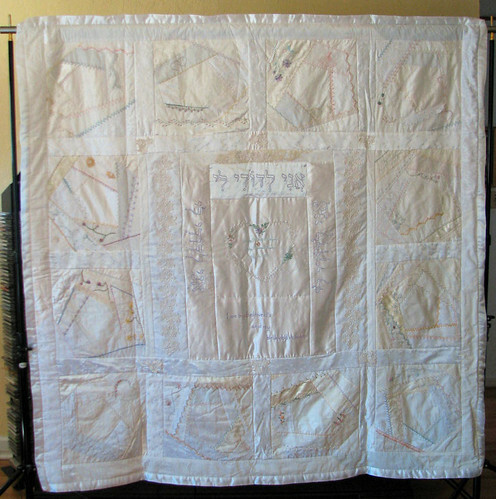 It is a crazy-quilted mainly-white chuppah. Lots of reflective fabric like satin to make it a challenge to shoot. And so damned white that the details don't show in the large shot. This is being entered into PIQF, so if you are coming to the show you might see it in person. 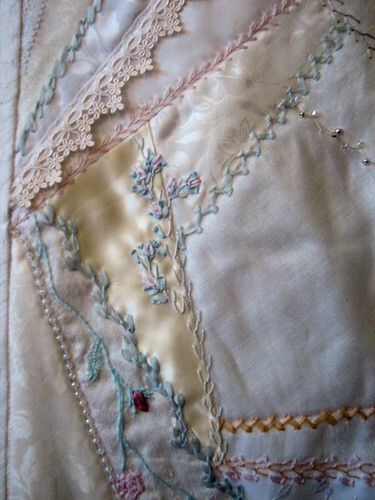 And wonder about all the truly fine needlework in it so far. It's "guardian" at the moment is fabulous Pickle-gal Jamie. Her intention is that this chuppah be used by all the children in this and perhaps several generations. There is lots of white blank space on each block intentionally so that each new couple married under it will have their names added to the project.